In order to be successful, one must establish habits conducive to reaching their goals and must have established goals in the first place. How can success be measured without a measuring stick? Most often I am most successful at tackling goals when I am ready to begin. Sometimes New Years isn’t the best springboard for me. I actually started getting in the habit of regular exercise in the middle of a desert summer two and a half years ago. I walked everyday, achieving 10 to 20,000 steps per day. It took 6 months to lose 20 pounds, but I did and it has stayed off for the most part except for the past few intensely stressful months. The success was achieved not through some magical diet, but through sweat, self-control, determination and measurable goals. I had a tracker, a measuring tape and an app that helped me monitor my progress and stay motivated. 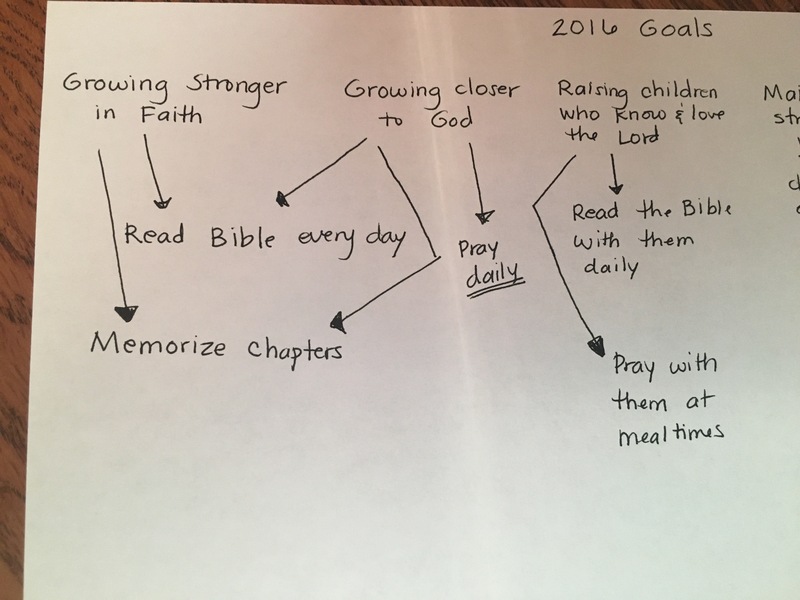 So moving on to weightier matters: how can we set and achieve spiritual goals for 2016? Step 1: Start with the big picture. What are the largest priorities in your life? Write them down. They should be at the top of your paper. This is a brainstorming process. Don’t worry about making it pretty yet. This is what my list included: Growing stronger in faith and closer to God. Maintaining a strong family. Raising children who know and love the Lord. Maintaining a strong marriage. Being a good steward. Growing wise. 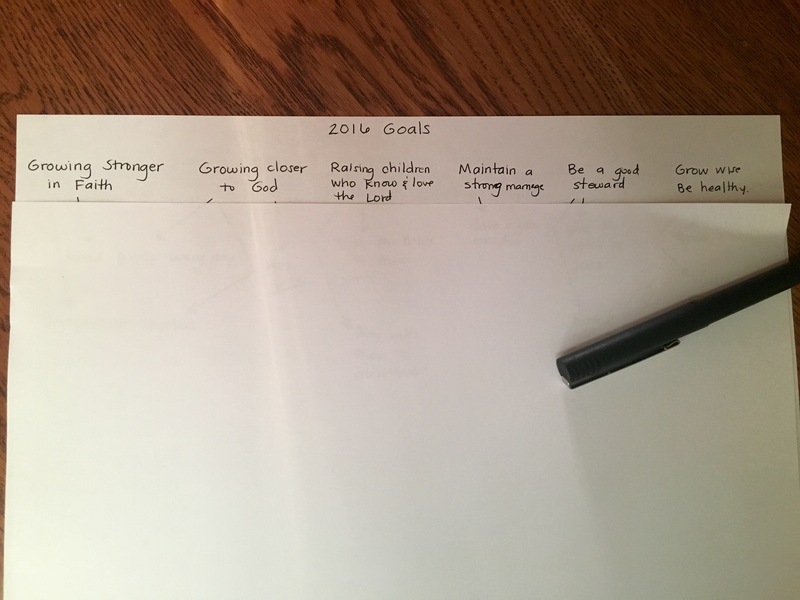 Those are lifelong goals—big picture priorities. If I put them up on my mirror, I will get discouraged. There is no gauge by which to measure these things nor a plan to achieve them. Those goals are things I have to do until I die. However, having your main priorities in place will help you decide whether your smaller measurable goals are good ones or whether they will be detrimental to your priorities. For example, a healthy family is a huge priority for us, but we also want financial stability. You must decide how that looks to you. How do you plan to achieve one without compromising the other? For some people, having a stay-at-home parent is vital, but that means living with less. It may even mean living in a place with a lower cost of living. If you have high financial goals, you could end up without a stay-at-home parent or have a very distracted stay-at-home parent trying to run a business and ignoring the children, essentially defeating the purpose of having a stay-at-home parent. Set big picture priorities first, then determine how to acheive the lesser goals without undermining your priorities. Here you want to write what you hope to achieve this year. 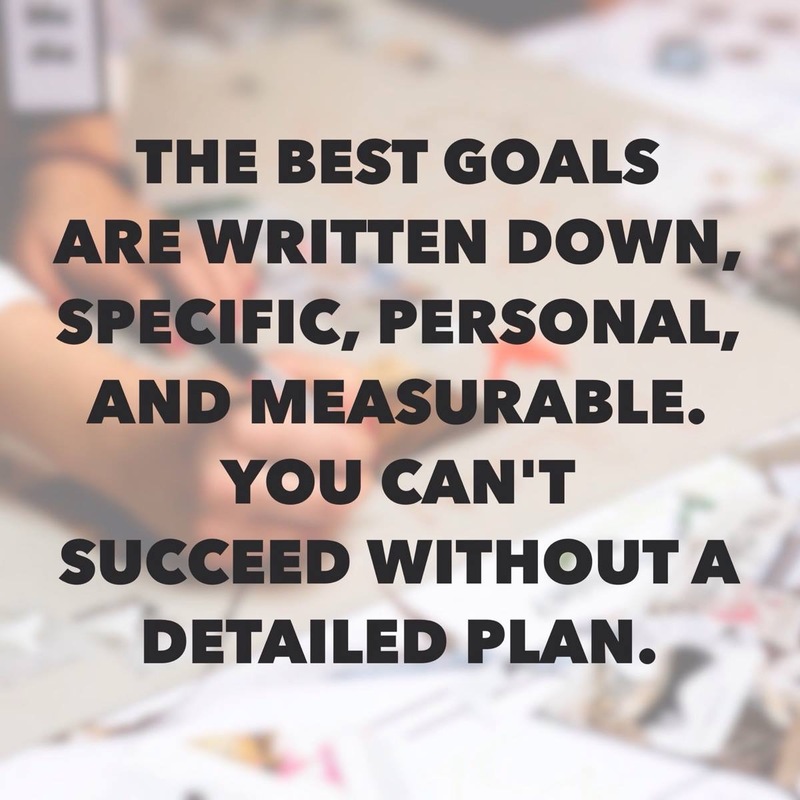 You may write “eat healthy” or “read the Bible more.” Those are worthy pursuits, but we need to make them measurable.Monitoring and measuring your success will aid your momentum. Let’s make one thing very clear when it comes to spiritual goals: checking things off a list does not make us more righteous or special to God. It does, however, help us to see that we are progressing toward a particular endeavor. If we never set goals when it comes to our spiritual walk, then we will be moving without direction. We need to be intentional, purposeful people in His service. One of my goals for the rest of my life, (and definitely for the coming year) is to read the Bible every day. That fits in with my “knowing and serving God priority.” Daily is measurable. I can check it off on my calendar or to-do list. If you want to read through the Bible in a year, you can use a BibleApp or a “one-year Bible” to help you track your progress. It is a very good, specific and trackable goal. (In my next post, I’m going to talk about different approaches to this). If you’re wanting to pay off debt (this falls under the stewardship priority), write down: “Pay off $6,385.47 in car debt.” That’s $532.25 per month. If your payment is $350, make a plan to come up with the difference. If you get an overtime bonus or tax refund, where will you put the money? If you start now, by March you might look at it and say, “I’ve paid off $1,596.37. I’m 1/4 of the way there!” Or, if you’re behind your target, you can decide how to step up your game. Either way, measurement is a motivator. Bible reading takes place early in the morning before I leave my bedroom. As soon as I leave the room, inevitably the dog wants feeding, the kids want to chat or some other demand is upon me before I can crack the cover on my Bible. I make it my goal to wake up earlier than I need to in order to pray and read. I give myself an hour. That’s my designated slot. Sometimes this gets upended because a long road trip requires me to be up at 4 am or someone was awake throughout the night and I didn’t get enough sleep so I miss my morning reading. When that happens, make a plan to do it at some other time during the day. We have been on shift work schedules for the past seven years complete with unforeseen overtime details—I know all about upset apple carts. Flexibility and prioritization are the aces in that game. It can be done! When I was walking every day, I had a set time to go walk. For the first four months, I would walk in the evenings after dinner. As seasons changed, I had to be flexible and change the “when” but I didnt stop walking. You need a strategy. There are times in life when all we can do is fly by the seat of our pants and hope we come out on top, but we should make it our aim to live most of our life with intention and purpose. When we had three kids aged three and under, we felt like we were flying the Milennium Falcon through an asteroid field, yet we still had as much routine as we could muster and made every effort to balance discipline and love. Goal: Read the Bible every single day. Strategy: Read in the morning before I get up. Set my alarm one hour earlier. Put Bible (or bible app) in the room away from the bed so i have to climb out of bed to get it. Read for 30 minutes. Goal: Walking a minimum 3-4 times per week. Strategy: Walk Monday, Wednesday, Friday, Saturday. Set shoes, socks, workout clothes, Fitbit, earbuds, beanie and sunglasses in a designated spot so I can get dressed quickly and go. In the winter walk immediately after lunch; spring, summer and fall, in the early morning after Bible reading. Get ready for everything to spoil your lovely plans. When I pray, sometimes I fall asleep. When I want to exercise, I get sick or sleep through my alarm. There will be times you fall short. Get back on the horse and keep advancing toward the goal. 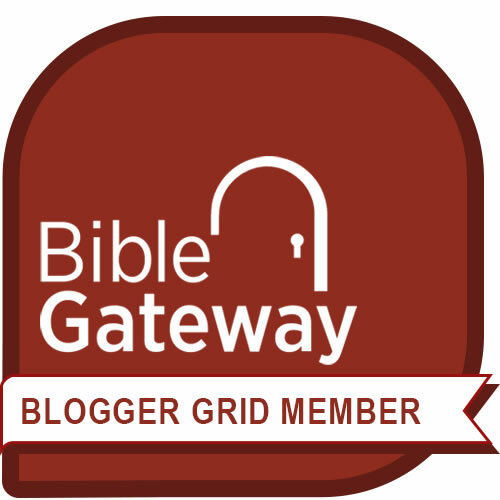 My next 2 posts are going to address some spiritual goals you may have for 2016, and some suggestions for achieving them. Man, I love your practical strategies. So easy to get bogged down in life. I need to make sure that I’m flexible and not feeling more guilt about not making a goal. Thanks also for saying that we are not “more special” to God by checking something off the list. Thanks, Dawn! I really appreciate your comments. They encourage me! Thank you so much for this post, the strategy bit was the most helpful for me & also where you encouraged us to fight. Thank you. Im so glad that it was helpful. May the Lord be with you.